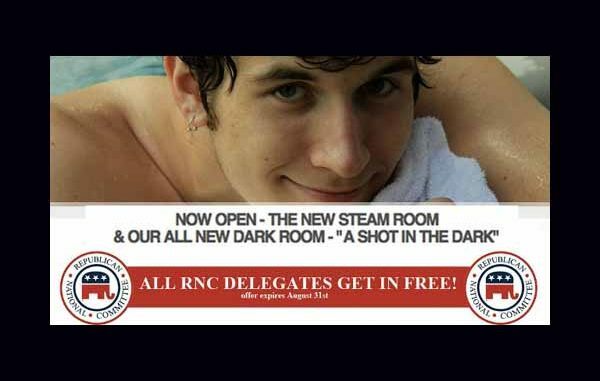 Tampa Florida gay bathhouse is offering RNC delegates free admission to their club.Who wouldn’t want a deal like that? I know I would. The Ybor Resort and Spa describes itself as Tampa’s favorite Gay Health Club, Spa and Resort. It is also a hotel which offers stays for up to a week or more. Located in the heart of historic Ybor City, “the cigar capital of the world” Ybor Resort and Spa has dramatically restored 1920s elegance with stunning Italian tile floors, soaring ceilings, chandeliers and original gold-gilt crown molding. Discreetly lit with rainbow colors at night, the front of YRS is on 8th Avenue, just one block from “La Septima” (7th Avenue), Tampa’s most exciting and exotic nightclub district where cigar factories have been transformed into Florida’s own version of Bourbon Street with balconies, ironwork and the rich heritage of Spanish, Cuban and Italian immigrants that fuels a festive atmosphere seven days a week.The home of the Gasparilla Pirate Parade and Guava-ween, Ybor City is also where locals find an escape from the modern world – at the Ybor Resort and Spa. the bathhouse is located in the “homo-heavy entertainment district famed for its riotous nightclub scene, which is often described as Tampa’s version of Bourbon Street.”Jervis also reports that the club is located less than one square block away from GOProud’s Homocon 2012. However Vincent Pawlowski, The Ybor Resort and Spa proprietor, is even offering all delegate customers a free Chick-fil-A sandwich and facial. It will interesting to see if any of these RNC delegates will take them up on their offer.